We hebben een geweldige tijd gehad en het appartement was meer dan prima voor ons! This is a fantastic apartment for 6 in the vibrant area of Gràcia. The district is best known for its local, Catalan-bohemian vibe and has plenty of top tapas bars, places to grab a drink, shops, cafés, restaurants and more. 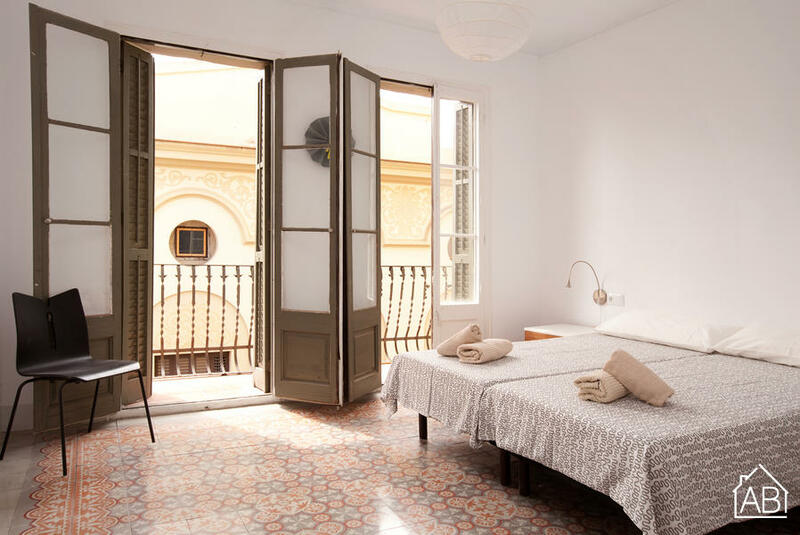 Furthermore, its only a short walk from the famous Passeig de Gràcia street, and the apartment is situated close to a metro station, allowing you easy access to the rest of Barcelona´s best attractions. With three bedrooms, there is plenty of space here for a large family or group. There are 6 single beds distributed throughout the bedrooms, two of which are together a bunk bed. The apartment has one full bathroom and one W.C. There is access to a balcony and the bright living room has a comfortable sofa where you can relax in front of the TV after a long day in the city. The kitchen comes fully equipped and there is a washing machine for your convenience. Situated in a brilliant location and with plenty of space, this is a great base from which to explore Barcelona. Please note: we have another apartment available on this building: 1927. The beautiful neighbourhood of Gràcia can be found at the top of Passeig de Gràcia,just across the Avinguda Diagonal street. It is one of the most charismatic ´barrios´ in Barcelona and a distinctive Catalan neighbourhood which reserves a small town ambience, inherited from its history as a town which was independent from Barcelona until the end of the 19th century. Wandering through the small streets of this cosy area, you will find a plethora of charming restaurants, many of which boast fine international cuisine. Gràcia is also home to a collection of locally-owned designer boutiques, as well as a movie theatre showing films in English with subtitles. Gràcia is popular among young residents and local students, but has managed to avoid many of the tourist crowds. As a result, its nightlife is lively and trendy, and the area is home to some fantastic bars with terraces. Just to the north of Gràcia is Gaudí´s famous Park Güell, from where you can catch some breathtaking views of the Barcelona skyline, including the nearby Sagrada Familia, the twin towers of Vila Olímpica, and the blue waters of the Mediterranean Sea. Choosing an apartment in Gràcia, offers a more relaxing way to experience Barcelona, and the town has plenty of convenient transportation services nearby for the 5 minute journey to the heart of the city centre.